Earlier this year Lynn Mead shared her wildly popular and incredibly easy and surprising Fassett tangle with us. Today she’s back, as a CZT, with a new tangle pattern she’s named Whirlee. Lynn sent along this photo of a couple of her maple seeds, or maple keys as I knew them. A stylized maple leaf graces the Canadian flag so I have a soft spot for maples. And maple syrup. Oh yah. 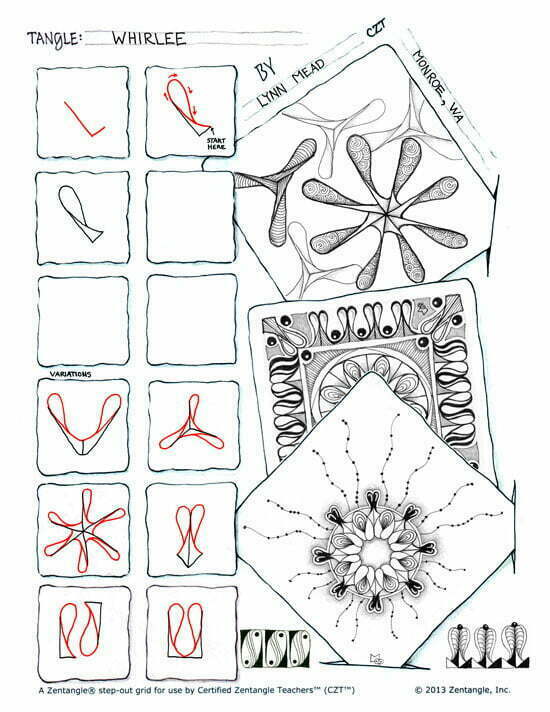 Now I know that many of you will find this lovely tangle very easy to draw. Looks simple. Not so for me. I gave Whirlee a whirl, in fact I gave it dozens and dozens [I am not kidding] of whirls. Inspired by Lynn’s beautiful drawings, I stayed with it — was it “the strength and endurance” of the maple? Anyway, I kept getting totally cockeyed lumpy renditions and it was very un-Zentangle®-like for me. Finally I came up with one example (with my own “twist”) I’m not embarrassed by and I maybe I should have stuck with Lynn’s border or ribbon-like variations. But once I butted heads with the version I was tackling, I could not let it go. Is this a tangle or a brain challenge??? I’m thinking Whirlee is my personal spatial challenge and I sincerely hope I haven’t discouraged anyone. I’m putting this out there for the rest of you to see what you can make of it. Here’s Lynn with her step-by-step instructions for Whirlee and a variety of pretty ways to change it up. Have fun! Check out the tag lynnm for more of Lynn’s tangles on TanglePatterns.com. Brilliant, love it…I can see this being a big favourite. Thanks for sharing. i cannot get this to work. every once in a while i see a clumsy correct outcome but i cannot “see” what i’m doing wrong, only THAT i’m doing it wrong. I LOVE this pattern, IF and WHEN I get the hang of it, I will likely overuse it because I do that with patterns I love. So if anyone has any helpful hints, I would simply LOVE to overuse this pattern. Joan, it’s hard to give you advice without being able to see where you are having a problem. My advice is to start with the basic shape and practice that until you feel comfortable with it. Also as I added here in a comment it really helps to make sure you rotate the tile so that you are drawing it at the same angle each time. Also don’t worry about the shapes all being exactly alike. Mine definitely aren’t. That looks really fun! Gotta try it! I’ll add a tip here. It really helps to rotate your tile so that you are always drawing the figure at the same angle. This will help keep the whirlees more consistent. Lynn, I LOVE your new tangle!!! I read every message from tanglegpatterns.com, looking at the step outs and checking in to see how I “feel” about each one. Love at first sight is rare for me, but I am instantly smitten with Whirlee! WooHoo!!! I’m glad Whirlee struck a chord with you. Hope you have as much fun exploring it’s possibilities as I have. Growing up on Mercer Island, Washington, we, as kids, often played with these seed pods, throwing them up into the air and watching them whirl as they came down – fond memories you’ve ignited! Glad to have sparked good memories for you. Enjoy using Whirlee. I think this is a perfect tangle to draw on a Fall afternoon. Have fun with it. I sort of can do this, but it’s sure challenging! It’s a lovely pattern, tho. I have my challenge tangles too. I treat them as just that a challenge and work at them till all at once they click for me. Never had one beat me yet! Thanks for giving Whirlee a whirl. This is so fun! Won’t it be beautiful on the wonderful glass Christmas Bulbs Linda showed us a few weeks ago? It is funny to read how something that comes so easily to some is so difficult for others?! That is the Joy of Zentangle and what makes it speak to all of us, I think! I think my whirlee has a movement disorder!! It’s quite lumpy and definitely not symmetrical! Ah well, practice makes perfect. I simply can’t do this one. I will keep trying through. I find zentangle very addicting. I start and don’t want to stop. I have bought many journals (on sale of course) to print and draw in and many pens. I still have not found a pen I truly like. I have some that leaked through the paper and then others that left ink on the paper preceding it and if I did a tangle on that page it now has images of the other one. I have started to put tissue between the pages until the ink is at least a week old. Any suggestions on pens. I love this art and what it does for me mentally. Thank you Linda for this site. Hi Linda, I suspect the problem you’re having is very likely more about the quality of the paper rather than the pens you’re using. Unless the journal is good quality art stock, most inks are likely to bleed. Regarding pens, for Zentangle® we always recommend the Sakura Micron 01 which has permanent, archival quality black ink. This pen was selected by Rick and Maria after thoroughly testing many others on the market. Hope that helps! Remember it is made up of three basic line types, straight line, curved line, and S-curve (or reverse S-curve). When drawing the S-curve, which seems to be what people are having an issue with, it helps to turn your tile so you are holding your hand in about the same position as you draw each one. Also, think about your take-off and landing point as you would for drawing Cadent. The S-curve has a large curve at the top but a small shallow curve at the bottom. Finally, sometimes you just have to practice long enough for your muscles to retain the memory of the action. I know this is true for me. This is the “practice” of Zentangle after all. Hope this helps and thanks for all your comments and for tryinng Whirlee. Hi Lynn, I love Whirlee! For me the secret is to watch the angle of the L shape. If I want to draw the tangle with three “blades” then the angle has to be be 120 degees. If I want to draw the tangle with six blades, that angle needs to be 45. If I want 4 blades, then the angle is 90 degrees. Turning the tile as I go, so the upright of the L is always facing up, is helpful too. Thanks again! Wow, Lynn! I’m loving this one! Great work, thanks! Thank you for a beautiful pattern that I as a Canadian can really relate to! Like Linda, I had some spatial problems with it even though it is not difficult – so I drew some foundational limes (tiny central triangle, hexagon, V, Y etc.) to make sure the arms went off in the right directions and were about the same size. Then there was how to do them so that the arms are the same length, and how to make the loop meet the top in a nice even curve. But practice helps, as with most things!